Italian renaissance: much creative thinking is needed to reanimate the original great economy. A new “anti-system” political coalition in Italy is stirring up the relative tranquillity of the Eurozone economy. Banks and businesses are fastening their seatbelts and preparing for a bumpy ride, John Egan reports. Italy’s economic woes run deep, as does the mistrust of the political system that is responsible for their making. It is a familiar cocktail consistently shaken around the world. Rising discontent among so-called “populist” factions has been fuelled by increasing economic disadvantage and mixed with aggravated concerns around immigration. Brexit, Trump and, most recently, the success of new anti-establishment political parties in Italy are among the very diverse democratic outcomes. In Italy the solutions favoured through the ballot box split the country in half. In the poorer south, the left-leaning Five Star Movement – which took 33 per cent of the overall vote – wooed voters with promises to boost pensions and create a universal income. In the more prosperous north, the far-right Lega Nord won much of its overall 17 per cent share of the vote with a pledge to repatriate 500,000 refugees. These strange bed-fellows – who share a distinctly Europhobic disposition – appear to have found sufficient common ground to form a coalition. 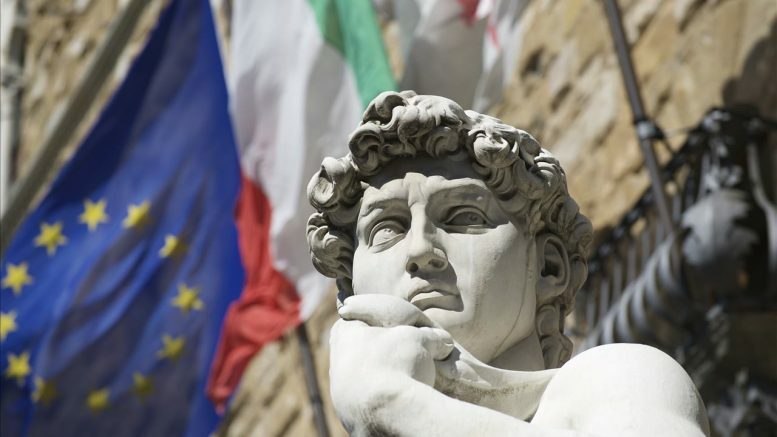 While coalition compromises have watered down a good number of those electoral pledges, one feature remains intact – to increase public spending and thereby reanimate the failing Italian economy. Such measures would normally elevate the already huge Italian debt and public deficit into the stratosphere above the conventional thresholds demanded by the Stability and Growth Pact of the European Union. A glance across the Adriatic at what happened to Greece when Prime Minister Alexis Tsipras and his Syriza colleagues embarked upon a similar venture in 2015 should stand as a warning. It can, however, also offer guidance. Learning from the Greek experience the Italian solution is not to boost public spending with euros, but with short-term treasury bonds, miniBOTs as they are called, that are seen as promises for reimbursement through future taxation – which itself is expected to be levied at a regressive flat-rate of 15 per cent on income. The miniBOTs could be issued on paper to companies on government contracts and individuals, such as civil servants, and through state pensions. They would effectively serve as a parallel currency to the euro, which is strictly against European Central Bank (ECB) rules. If it all goes awry, a plan B for the miniBOT to replace in extremis the euro as a national currency may not be that far from the thinking of some Italian eurosceptics. The proponents of the miniBOTs declare they are not a currency and their use does not infringe ECB rules, nor exceed financial debt and deficit thresholds. However, the miniBOTs may be used to buy commodities if the supplier consents – probably with some margin between their euro value – and they may also be used to pay government bills, such as taxation and public transport, at their face value. Turning the south Italian shopkeeper into a bond trader may lead to unexpected outcomes. Analysis by the Financial Times suggest this might cause a perverse re-distribution of income. It is expected that Brussels and Berlin will take a very dim view of the miniBOT concept. Italy’s economic problems are structural, the consequence of an abysmally low growth in labour productivity for well over a decade. Labour productivity growth in Italy. Source: OECD Economic Outlook Database. A recent OECD Economy Survey of Italy lays out this diagnosis in great detail. The weakness of capital investment for many years, by both industry and Government, has led to inefficiencies in production, innovation, administration, infrastructures, skills and education. Reparative measures are proposed in equal detail. 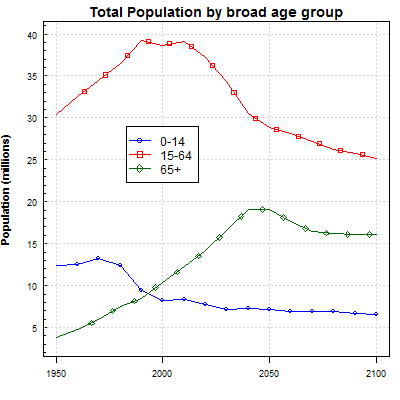 Perhaps Italy’s greatest challenge in the long-term is to sustain a productive economy with a rapidly ageing population. About 35 per cent of Italians will be over 65 by 2050, further diminishing the capacity of a weakened workforce. It will take more than miniBOTs to resolve that demographic conundrum. For this, Europe needs to be part of the solution and deployment of a skilled immigrant community, à la Germany’s Angela Merkel, could offer much-needed productive capacity – if the essential political leadership can prevail. The Five Star Movement-Lega Nord ruling coalition selected Professor Giuseppe Conte to head a newly formed Government. Last night he resigned after failing to convince Italian president Sergio Mattarella to accept Paolo Savona, an 81-year-old economist and former industry minister, as Finance Minister. Professor Savona has described the euro as a “German cage”, a remark that has not endeared him to Italy’s pro-Europe president. The political collision between Mattarella and the governing coalition parties has created a constitutional crisis in which the President, who claims to be safeguarding the prosperity of Italy’s citizens is accused of acting against the will of the people. New elections await. The logic of choosing Professor Conte, a technocrat with little political experience, to lead a heterogeneous coalition government through such treacherous waters is not immediately obvious. However, according to mutterings reported in the European press, if it all goes awry, a plan B for the miniBOT to replace in extremis the euro as a national currency may not be that far from the thinking of some Italian eurosceptics. The Italian business community from the north of the country is not unduly alarmed, it is reported. For them, the need to live with political instability is nothing new and the country has remained resilient. In a 2017 Eurobarometer survey, 59 per cent of Italians favoured being part of the European economic union with the euro as a common currency, compared with 30 per cent against. On the streets of Rome yesterday the finale of the Giro d’Italia was played out. It may be seen as a metaphor for Italy today. The steel-hard no-pain-no-gain discipline of fiscal austerity and Schumpeterian creative destruction is an ingredient for success. But so is the orchestrated teamwork that is magnificently demonstrated over the three-week competition. MiniBOTs aside, some new thinking is needed to stem the self-destructive hangover of the austerity and immigration cocktail. Without this Europe is in for a bumpy ride.